Dry eye and dry mouth are typical clinical symptoms of primary Sjögren’s syndrome (pSS), yet not considered in the assessment of severity and predictors in China. This study aimed to investigate the prevalence, severity, and potential predictors of dry eye/dry mouth among Chinese pSS patients. A cross-sectional study was conducted from the Affiliated Hospital of Nantong University. A series of questionnaires were applied: Ocular Surface Disease Index (OSDI), EULAR Sjogren’s Syndrome Patient Reported Index (ESSPRI)-dry mouth items, fatigue severity scale (FSS), the 10 cm visual analog scale (VAS). Laboratory examinations were taken to obtain some biochemical indicators (i.e., C-reactive protein, erythrocyte sedimentation rate, anti-SSA/SSB antibody). Stepwise logistic/linear regression model was used to investigate the potential predictors of dry eye/dry mouth, respectively. Statistical analysis was performed using SPSS version 20.0. Two hundred twenty-four pSS patients were included in this study. Among them, 215 (95.98%) patients reported ESSPRI-dry mouth items score > 0, and the mean score was 4.92 ± 2.43. In addition, according to the score of OSDI, 84 (37.5%) subjects reported non-dry eye, whereas 140 (62.5%) subjects reported dry eye (44 mild, 31 moderate, 65 severe), and the mean of the total OSDI score was 25.01 ± 23.58. Then, using logistic regression and linear regression respectively, we found that age and fatigue were the potential predictors of dry eye, whereas dry mouth was predicted by age, fatigue, total pain, and ESR. 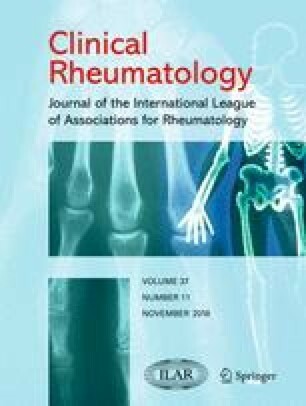 The results of this study suggested that rheumatologists should pay attention to pSS patients’ dry eye and dry mouth, especially those with older age, higher level of ESR, more severe fatigue, and pain. Zhenyu Li, Ting Fu, and Lin Li contributed equallyto this work. The authors would like to thank Jing Li, Genkai Guo, and Yunfei Xia for their valuable help in patient recruitment and data extraction as well as all patients who participated in the study. This study was supported by National Natural Science Foundation of China (Grant No. 81671616 and 81471603); Science and technology Project of Nantong City (Grant No. MS32015021 and MS22015064 and MS22016028); the project of “333 Natural Science Foundation” of Jiangsu (Grant No. BRA2016527). All procedures performed in this study were in accordance with the ethical standards of the institutional research committee (approval number 2017-K003).